Revolights Bicycle Lighting System. The First Chapter. 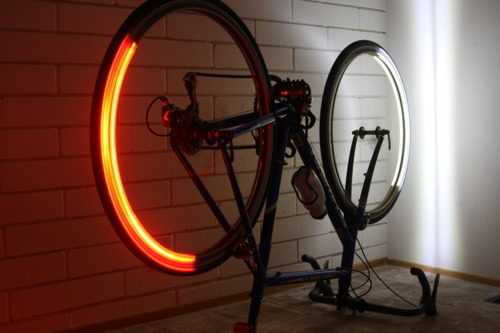 Revolights are a legal headlight, smart brake light and a dramatic increase in side visibility. A true 360º lighting solution for your night riding safety.See and Be Seen. 1,442 backers pledged $215,621 to help bring this project to life. Thanks for checking out our project. We hope you are as excited about revolutionizing the bike light industry as we are. With your help, we will morph the Revolights bike lighting system into an innovative solution used worldwide. We recognize these lights are different, but we're from the Bay Area where different is, well, sometimes better. People aren't used to wheel mounted lights, but simply put, we intend to change that. Today we have a product (patent pending); a product we're proud of and believe in, but it's not complete! Our goal here on kickstarter is clear... we must further the revolution; the bike lighting revolution. We must raise enough support to take the Revolights bike lighting system through the rest of design and final product development. We will take them from where they are now (v4 below) to where they will be at the end of 2011, as a viable, user friendly, finished product. What is the Revolights bike lighting system? Our lighting system consists of 2 thin profile LED rings (white in front, red in back) that mount directly to each wheel rim (just below the brake calipers) using a series of rim specific clips. Power is supplied via a thin wire to the hub where a lightweight and slim, USB rechargeable polymer lithium-ion battery is held in a special bracket. A small magnet is secured to the fork to provide speed and orientation information to the rings. Where's development at? We currently have the 4th design version complete of the rings and clips. The rings are made of lightweight aluminum alloy, which can be finalized into a production 5th design version quickly. 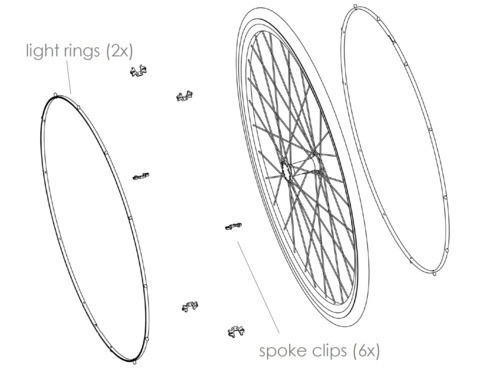 The clips are currently developed for 700c Road and Hybrid Bike style rims only. The battery holding device is in initial design. The first design version of the battery holding device will be complete by the end of the funding duration. The developmental process will take Revolights right up to the point where they will be ready for manufacturing tooling. What's the money for? As mentioned, we are on prototype design version 4. V4 currently demonstrates all of the critical functions: it is simple to install, does not interfere with the ride, and is fully functioning. But we need to incorporate further design elements to get it to a production ready status; i.e. to a place where it can be used by everyone. This involves construction of a 5th, possibly 6th, prototype version in quantities that will allow testers to assure the lights are ready for prime time. If funds remain, we will use them to build the working capital necessary for manufacturing the first production batch of the Revolights bike lighting system. How long are we thinking this will take? If you become one of our supporters, you will get exclusive, regular updates on our status. We believe in transparency, both procedural and financial. We want you to know everything we know. We want your monetary support, but need your involvement. We've got some cool stuff planned. We promise you won’t be let down; let’s ride. The invention began as little more than an after school idea, but has blossomed into a product that we believe can throw a new "spin" on bicycle rider safety. 1) lighting - allows riders to safely navigate at night by illuminating their forward path. 2) sighting - increases the rider's front, back, and side visibility which signals their presence (i.e. i am a bike) and location to those sharing the road. Currently no product on the market provides both lighting and sighting at a functionally high level. Our solution, the Revolights bike lighting system, is a double threat. It represents the first fully functional lighting and sighting solution; more specifically, the first solution based on a spoke/rim/hub mounted design. And finally our hypothesis… an increase in bicycle lighting and sighting has the potential to reduce rider injuries and fatalities. It's time to provide riders with a single bike light solution that allows them to safely experience the joy of riding, regardless of the time of day. Let’s shift the bike light paradigm. [THE PELOTON] ... Receive a personalized thank you card from the Revolights founders + ability to follow the project’s progress as a kickstart backer through kickstarter blogs, twitter, facebook, etc. [THE WHITE JERSEY] ... Receive a Revolights decal, and Revolights team membership; which includes access to key project milestone updates that will directly link you to the Revolights project and its future (+ rewards listed above). [THE POLKA DOT JERSEY] ... 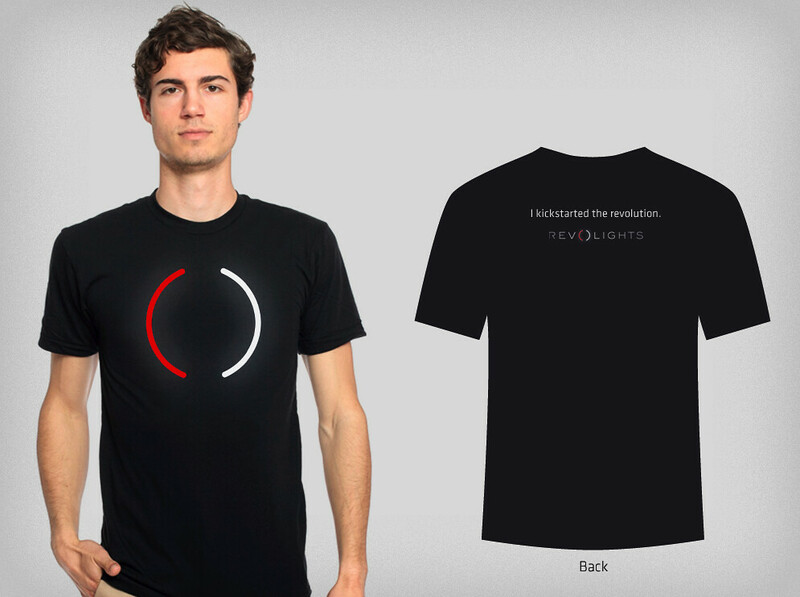 Receive a custom, project branded t-shirt that will further link you to Revolights through kickstarter, and its future (+ rewards listed above). [THE GREEN JERSEY] ... Receive a brand spankin' new, pre-ordered set of the finalized Revolights (to MSRP for $220), that will be shipped prior to public release. They will look like what you see here in v4, but upgraaaded. Via team member updates, you'll also be able to access key project updates all the way through your lights' shipment (+ rewards listed above). Note: shipping to Canada add $20, international add $30 to pledge amount. [THE YELLOW JERSEY] ... Receive a brand spankin' new, pre-ordered set of the finalized, CUSTOM Revolights! You'll not only get your lights before they are released to the public, but you'll also be able to cruise your Revolights in style after selecting the (legal) taillight color of your choice from our color palette. Your name will be added to the revolights.com website as a "Yellow Jersey Backer". Via exclusive team member updates, you'll also be able to access key project milestone updates all the way through your lights' shipment (+ rewards listed above - [THE GREEN JERSEY] rewards). Note: shipping to Canada add $20, international add $30 to pledge amount.